It's that time of year again. Summer vacation and Goose's birthday. Huh? What does that have in common? Well, for the last couple of years, plenty. You see, on our way down to the States, it has coincided with Goose's birthday. And since he lives in Bellevue, we can easily meet up with him for dinner. Thus, much like last year (when we met up at McGrath's Fish House, now thankfully closed), we met up again on our way back from Portland. Originally, we were supposed to meet at Joy in Sushi (insert joke here). But for some reason or another, we ended up at the Blue Ginger. We weren't aware of this until some furious texting btween Viv and Goose while I was speeding up the I-405. Luckily we caught wind of the change in plans before it was too late. A quick re-enter into the GPS and we made our way into Bellevue. If the name Blue Ginger rings a bell, it is the same name as Ming Tsai's restaurant. But there is absolutely no affiliation at all. 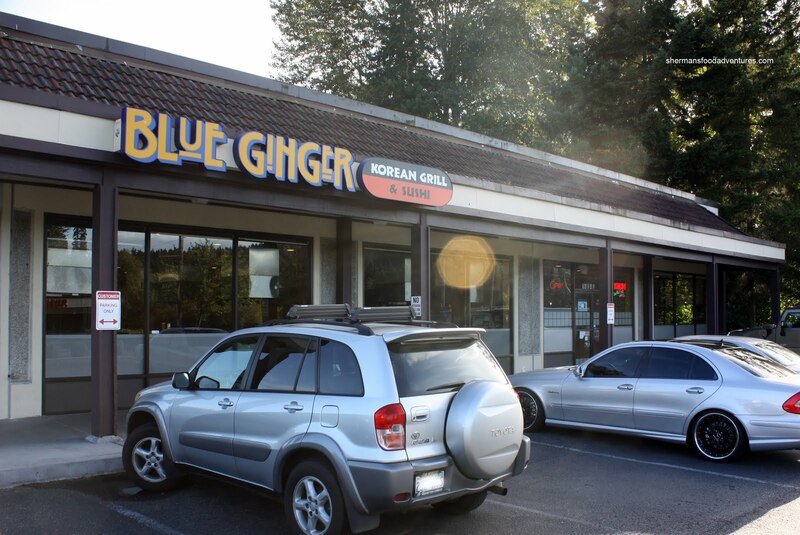 This Blue Ginger is a Korean/Japanese restaurant. Okay, now for those who live in Vancouver, I'm sure there is a level of skepticism when it comes to Asian food in the Greater Seattle Area. Well, it has gotten a lot better and there is no need to visit places like PF Chang's. Walking into the place, it is very much like any other Korean BBQ restaurant with built-in units complete with large ventilation hoods. To make the meal interesting, we'd have 4 kids at the table. 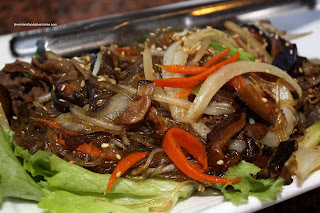 It is literally playing with fire when we bring the kiddies to Korean BBQ or Chinese Hot Pot. It takes multi-tasking to a whole new level where one not only has to cook their own food, they need to feed the kids, make sure they don't cook the kids with spilled hot broth or any wandering hands. Add a camera with flash into the equation and I was so swamped with multi-tasking, I practically BSOD (blue screen of death) like a Microsoft OS. Fortunately, I don't have to reboot in safe mode and I just carry on with no food in my stomach; but with a bunch of pictures instead. To further complicate things, much like a full desktop of icons, our table was not remotely sufficient for the amount of food. My son was uber-annoyed at the large plate of salad placed in front of him throughout the meal. It was the lesser of 2 evils. Plate of salad or plate of raw beef. Salad it is. 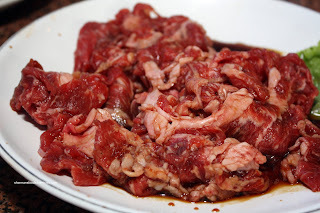 As for that Bulgogi, it was fatty, tender and distinctively marinated in the typical sweet soy mixture. Combined with a BBQ that didn't have too many flare-ups while still being hot, the meat received the necessary charring. We also got the Kalbi and it turned out to be tender as well. Strangely, the Banchan arrived after the meats. No matter really, we were too busy grilling to notice anyways. 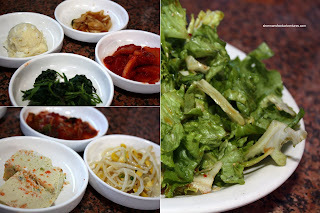 It consisted of spinach, potato salad, spicy radish, kimchi, sprouts, steamed egg, and pickled onions. For me, it was pretty average. Nothing that I really wanted more of; but then again, they did their job. We also got the condiments required to eat the BBQ meats such as slivered garlic, peppers and bean paste. But curiously, we didn't get the romaine lettuce to wrap it in. Rather, we got a salad made of romaine. Not sure why it was served that way... From this point on, the food came quickly and filled up the entire table. 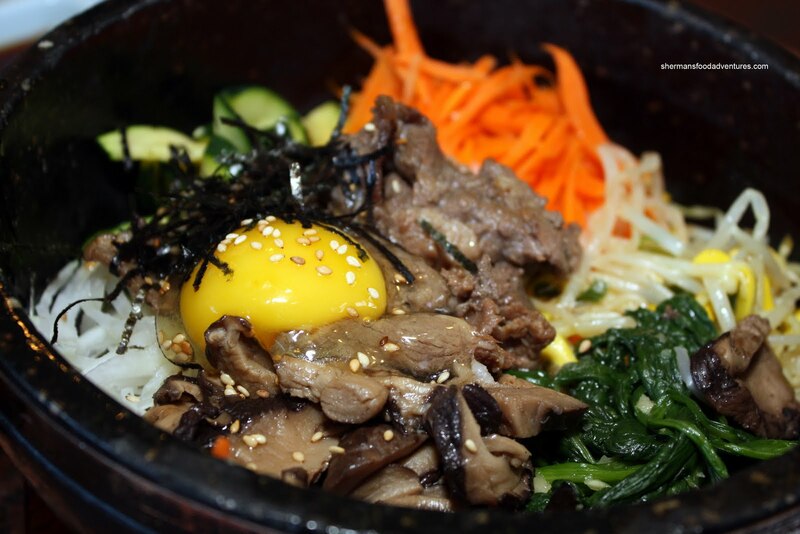 The Dolset Bibimbap came sizzling hot with well-cooked rice and plenty veggies, beef and raw egg. I really liked how the rice was not mushy (which seems to happen much too often). With the standard things we order, of course next came the Japchae. At a reasonable $11.00, it was a reasonable portion. A tad wet and overloaded with too many veggies, I thought this was only okay. Flavourwise, it was slightly bland while the wetness of the noodles made it hard to eat. Another predictable dish in a Korean restaurant is the Pajeon (Seafood Pancake). Normally, I'm really not all that excited about it since there is no seafood and the oil at the bottom can rival any pan pizza from Pizza Hut. As you can see in the picture, there is plenty of seafood and it's not merely imitation crab meat either. 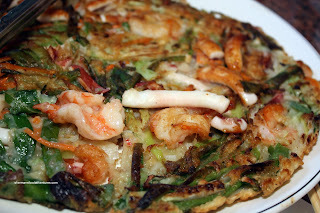 However, I found the pancake too wet and doughy from the copious amount of green onion. I know that green onion is an integral part of the dish; however, there was far too much green onion! 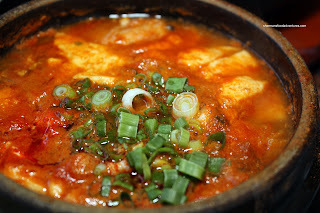 With only a sprinkling of green onions, the Jjigae (Spicy Tofu Soup) was pretty much what we expected. Only moderately spicy with plenty of silky tofu and seafood, this was good. It went well with the many bowls of white rice which were included with various dishes. Epic fail on my part since we had 2 Dolset Bibimbaps! 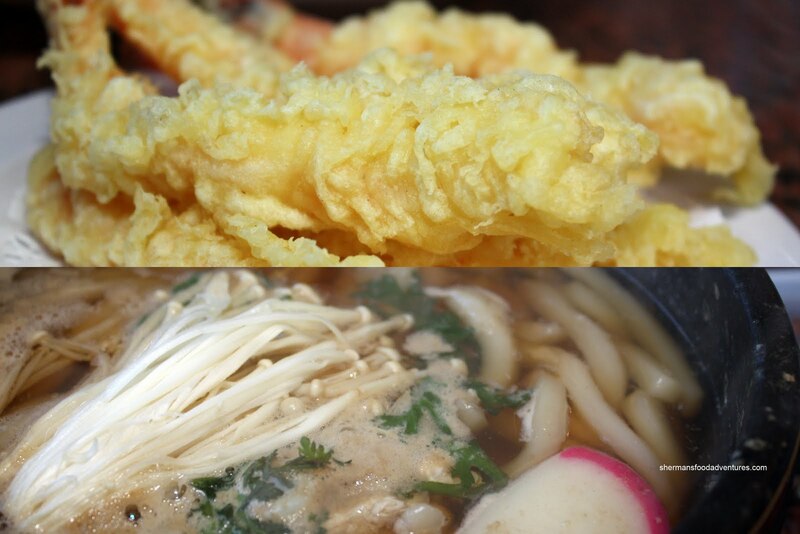 With 4 kiddies at the table, it is a given that we got 2 orders of the Ebi Tempura Udon. Now, for the udon itself, it wasn't too bad. The noodles were not overcooked and the broth was decently flavourful without being salty. Not much depth; but okay nonetheless. Now the ebi tempura... Let's just say that the batter was caked on more than makeup on Joan Rivers' face. It was nearly impenetrable. Soggy, doughy, cold and dry, this was really bad tempura. To top it off the ebi was gummy. Yuck. I give them credit in making it purely ebi tempura (without the veggies); but it really was pretty bad. Okay, for a while there, we thought the meal was done, no more food coming out. 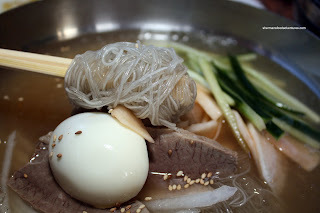 Then we figured that the Naengmyeon (Cold Buckwheat Noodles) was missing. Not sure why it arrived so late into the meal... Well, it was certainly ice cold and the noodles were chewy. The broth was distinctively vinegary with cucumbers, daikon, sliced beef and boiled egg. 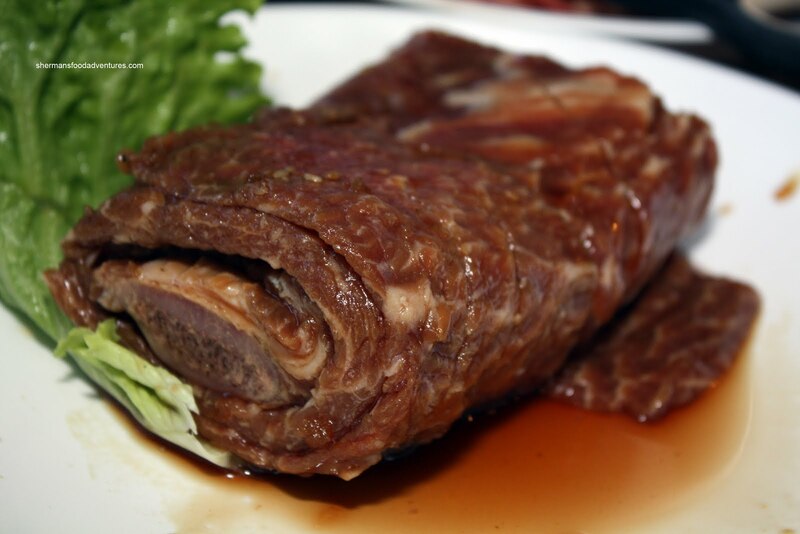 This is mostly a textural dish and based on that alone, this was good. In general, the food was passable and didn't offend (well, maybe the tempura). I thought it was reasonably-priced and the service was okay as well. I wouldn't necessarily be active in planning my next visit (especially since I'm in Vancouver); but it does the job if you are nearby. @deborah Ah... Thanks for the info!